When Captain Cook sailed into Botany Bay in 1770, we did not know how many planets were in our solar system. We only knew about Mercury, Venus, Earth, Mars, Jupiter and Saturn. Based on the orbits of these planets, 18th century European astronomers invented what is now called the Titius-Bode relation. It’s a simple empirical relation that describes the relative distances between the planets and the sun. It predicted the orbit of another planet beyond Saturn and another planet in the gap between Mars and Jupiter. In 1781, William Herschel found Uranus – without relying on the Titius-Bode relation – but he found it in the orbit beyond Saturn where the Titius-Bode relation said it would be. After this success, astronomers started looking for a planet between Mars and Jupiter in the orbit predicted by the Titus-Bode relation. In 1801, Giuseppi Piazzi found a planet in the predicted position and called it Ceres. The Titius-Bode relation was on a roll. But when Neptune was found in 1846 it wasn’t exactly where the Titus-Bode relation predicted it would be. And over the years so many small bodies have been found in orbits between Mars and Jupiter that Ceres was plutoed – demoted to an “asteroid”. And so the Titus-Bode relation lost its shine. And like an old horse, it was put out to pasture. It was only taken seriously by numerologists and cranks. But then along came NASA’s Kepler Space Telescope. Over the past few years Kepler has been able to detect thousands of exoplanets and hundreds of multi-exoplanet systems. 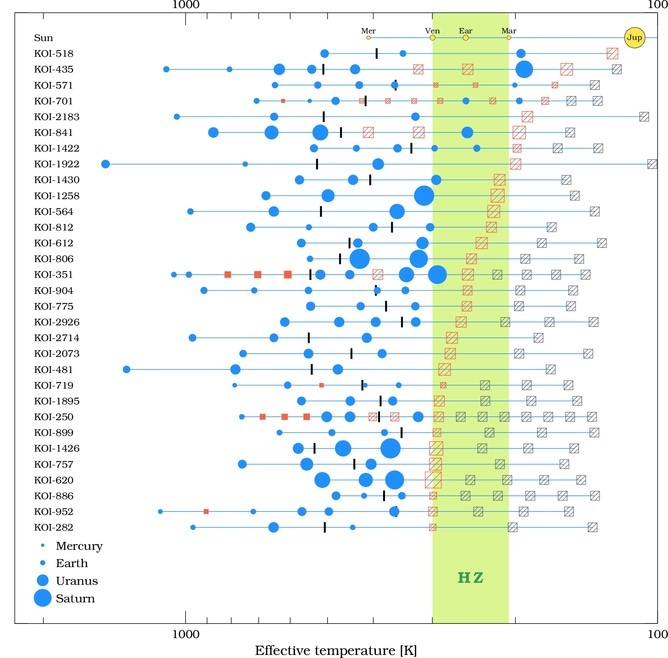 Along with my PhD student Tim Bovaird and Master’s student Steffen Jacobsen, we reasoned that if the TB relation had been such a useful (if somewhat imperfect) guide for predicting planets in our solar system, maybe it would be useful in predicting planets in the new exoplanetary systems detected by Kepler. We checked the hundred or so systems where Kepler had found at least a few planets and we found that the majority of these exoplanetary systems adhered to the Titus-Bode relation even somewhat better than our solar system did. Thus, we became convinced that the horse still had some miles left in her – that the semi-taboo Titus-Bode relation could provide useful hints about the periods of as-yet-undetected planets around other stars. Last year we used a generalised Titus-Bode relation to analyse 68 multi-planet systems with four or more detected exoplanets. We made predictions for the existence of more planets in these systems, based on the Titus-Bode relation. So far, 5% of our predictions have been confirmed. This may sound like a small percentage, but given the inability of the Kepler telescope to see Earth-sized planets or smaller, a 5% detection rate is what you would expect to see if all the predictions were true. The Goldilocks zone or habitable zone around a star is where the temperature is just right to have liquid water. 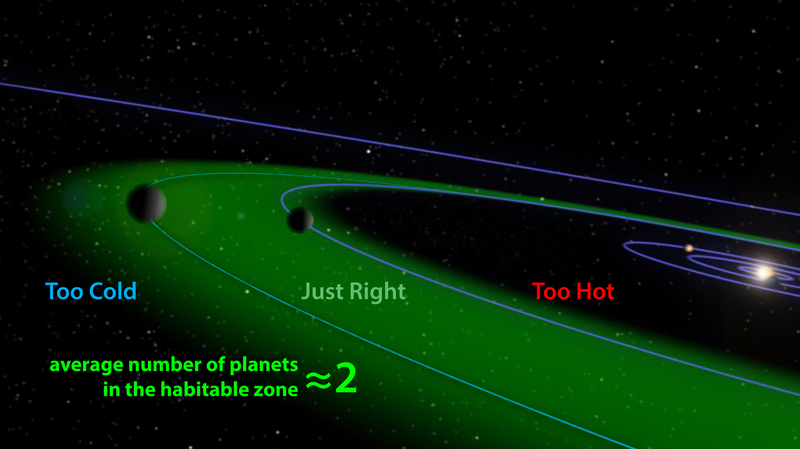 Our new result suggests that there are, on average, two planets in the habitable zone. Almost all of the exoplanets detected by Kepler are larger than Earth and very close to their host stars. This is almost certainly a selection bias. 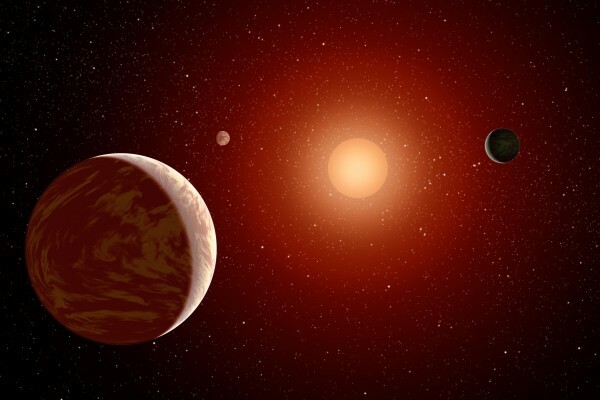 It is very difficult for the Kepler telescope to spot planets that are far enough away from their host stars to be in the habitable zone (where the temperatures are in the range where H2O will be liquid water). Using the Titus-Bode relation is a controversial indirect technique, but I think it’s the best one we have if we are interested in answering the question: How many planets (on average) are in the habitable zones of stars? How many potentially habitable planets? Our answer to this question is 2 ± 1 and was published this week in the Monthly Notices of the Royal Astronomical Society. The figures (above and below) illustrate our result. The names on the left are the names of 31 Kepler exoplanetary systems. The blue dots are exoplanets detected by Kepler. Red and gray squares are our Titus-Bode-based predictions. The green horizontal band is the habitable zone. For comparison, the first system (at the top) is our solar system. The Earth is in the middle of the habitable zone. With about 300 billion stars in our galaxy, our result means there are 600 ± 300 billion planets in circumstellar habitable zones in our galaxy. In the observable universe there are about 100 billion galaxies. Thus there are approximately 1022 stars in the observable universe and twice that many planets in circumstellar habitable zones in the universe. That’s a lot of real estate for alien development. Not all of these habitable zone planets will be wet and rocky like the Earth, but a fair fraction (about 30%) should be. Now we need some zippy interstellar spaceships to colonise and over-populate all these worlds before the aliens do.